With twenty odd years in the game Sean has seen and done it all, so it was the particular challenge that Ralph set that got him excited, “I was really “all in” when he mentioned wanting a mono shock swingarm!” But then of course there was one last detail Ralph needed to mention before Sean could get to work, the bike had to be done in less than three months! 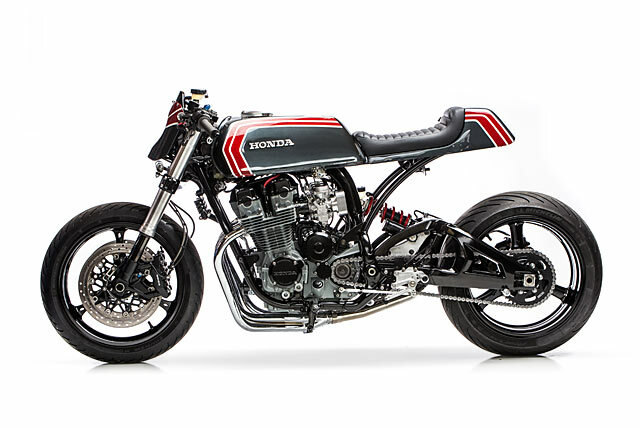 Immediately he got started and took on the engineering side of the project first with the Honda torn down and the stock, twin shock, swingarm removed. With the tape measure out and plenty of research he discovered that the early Kawasaki ZX10’s had the same width at the pivot point. But on a search of eBay he came across a later model item and given the bargain price he decided it was worth a try. 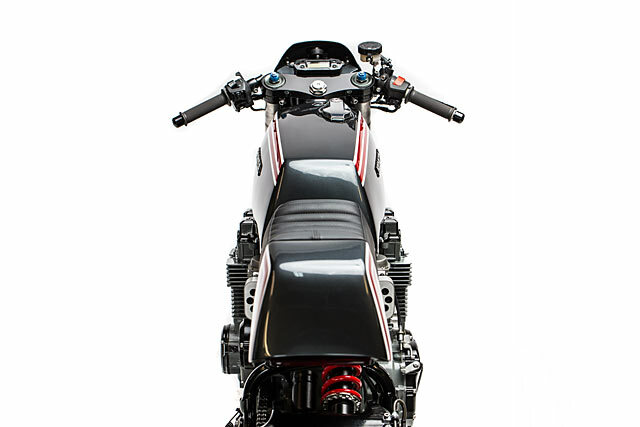 “When it arrived I found that it was going to be a snug fit and would require a bit of frame modification. After boring the frame from 15mm to 20mm for the pivot bolt I made some spacers to get the swingarm into place,” explains Sean of the process. But there was a pleasant surprise to be had when the hard work was done. 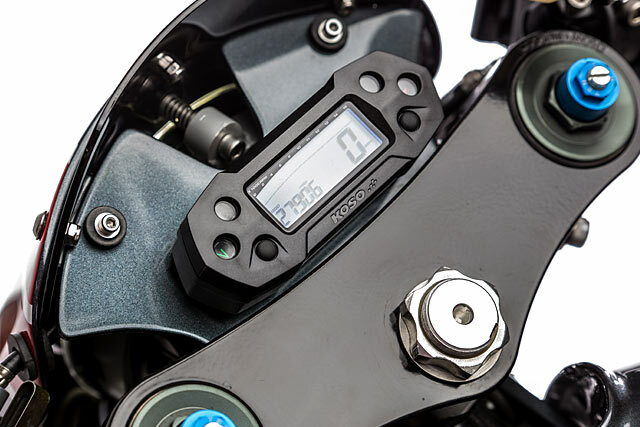 The Kawasaki swingarm has an offset shock position and what would you know, it meant the shock would perfectly line up with the Honda CB backbone. Sean then put his prodigious fabrication skills to further use by crafting new shock mounts, top and bottom, and the swingarm conversion could be checked off the list. With such a trick rear end he couldn’t just leave the stock spindly front forks in place. So a call to Cognito Moto had one of their conversion kits in the mail, including steering stem and upper triple clamp. All of which made fitting a set of inverted forks from a Suzuki GSX-R 1000 a breeze! They also donate their big twin disc front brake setup clamped by Tokico calipers. While the Gixxer lightweight alloy wheels are now shod in Michelin Pilot Power rubber for a full rolling chassis overhaul. 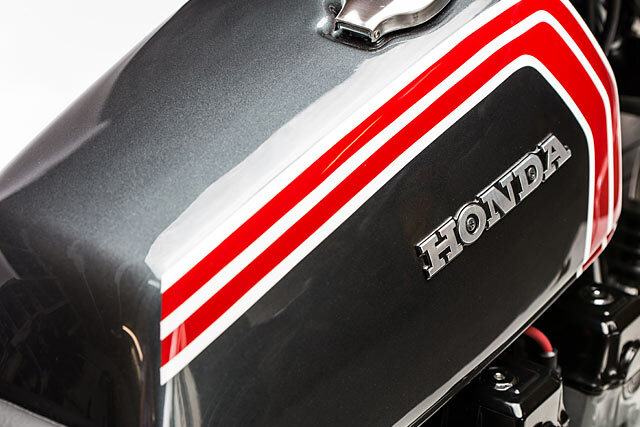 The modern version of the faithful Honda 750cc air-cooled engine received a full going over and a fresh look with a hit of enamel paint, powder coat and all new stainless bolts. The factory Keihin carbs took a trip to the vapour honing cabinet and come out looking better than new. 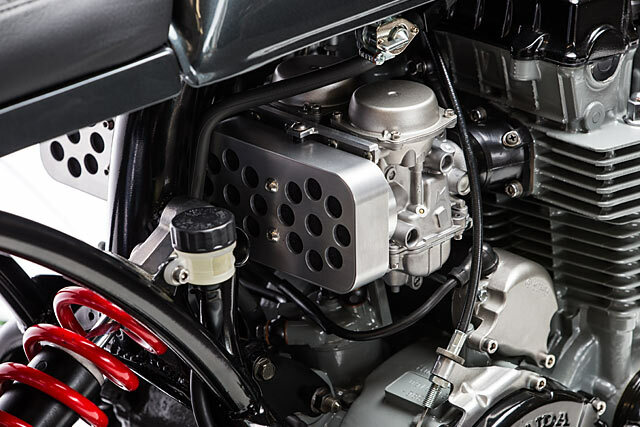 To ensure their operation is flawless they’ve been fully rebuilt and now draw air through one of Steel Dragon Performance’s stunning fully machined airboxes. 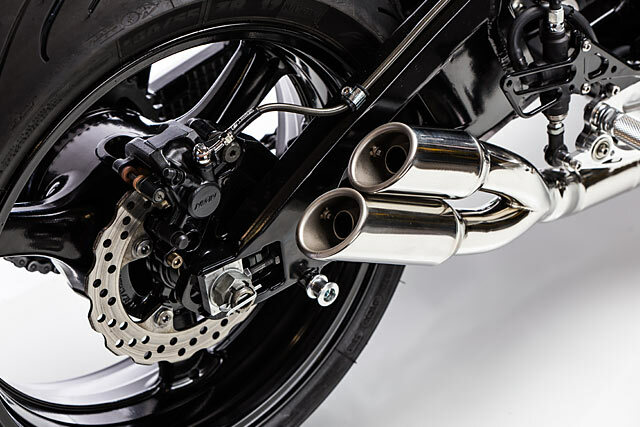 The headers come from industry legends Vance & Hines but it’s Sean’s own genius in making the slash cut twin tip muffler ends perfectly align with the swingarm that seal the deal. Now the CB had power to burn and the handling to put it to use Sean could concentrate on bringing to life the visual image he had in his mind. 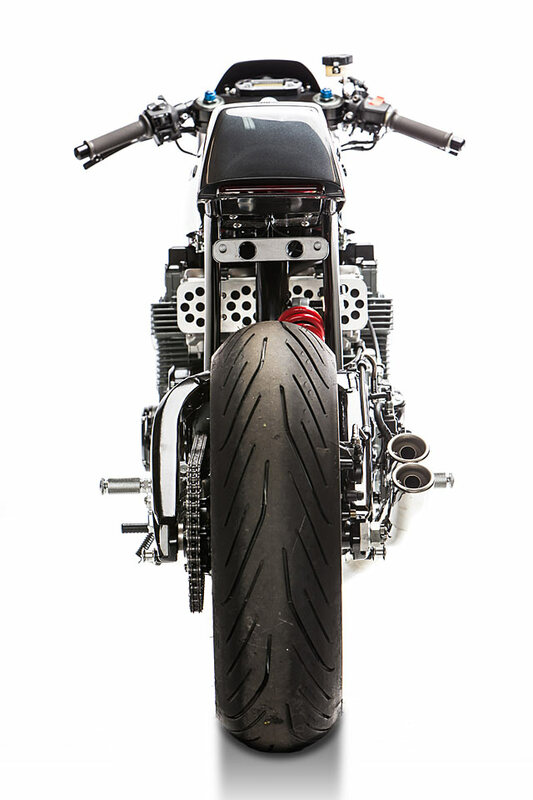 “I have been dying to use an XS500 gas tank on a build and this was it. 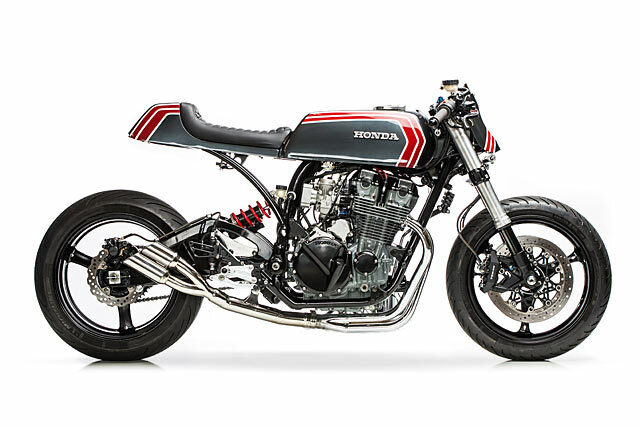 This particular tank has sharp lines and angles that complement the very square CB750 engine.” With the Yamaha tank sitting on the frame Sean could make the drawings to work out exactly how to design the subframe to complement the change. 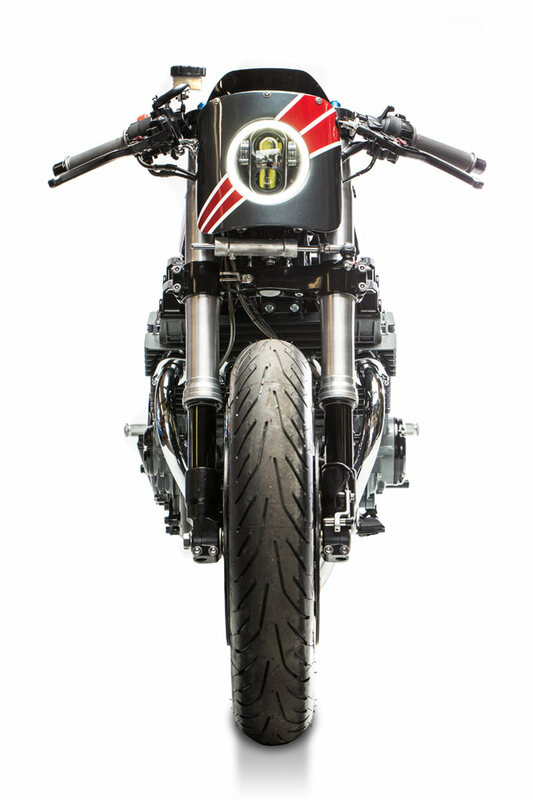 With the upper sections tacked into place and the total length calculated the subframe supports were then bent to mimic the radius of the swingarm, brilliant! To create a tail section that truly matched the lines of the tank Sean found another XS500 unit that had seen better days and chopped the rear off. This allowed him to create the perfect tail cowling that neatly integrates with the seat base to allow the lines to flow flawlessly from front to back. The seat itself was shaped and formed at MotoRelic to perfectly fill the gap before being sent out to Counter Balance Cycles to stitch on some sumptuous leather. 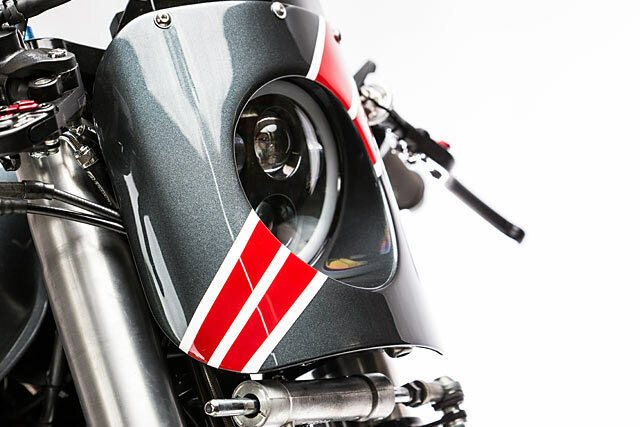 Sean could have mounted up a traditional cafe racer headlight and called the bodywork done but he wanted to go the extra mile with a custom headlight bezel. In his own words he saved “the worst for last” but the overall impact and attention to detail is worth the struggle. Sean then decided he’d make the job even harder for himself, “I was determined to not use any clamps on the forks to hold it in place. I machined the upper and lower triples to hold a set of aluminium uprights. With brackets welded to them, they would hold the headlight and the KOSO gauge cluster.” The bezel itself is beautifully shaped from aluminium but getting it all to fit was a challenge that no doubt resulted in some blue language in the Virginia workshop. The LED light is secured with a specially machined ring and together with compression springs means the light is fully adjustable. Now with the bodywork done it was sent out to Homeward Bound Motorcycles for paint, who have done an incredible job, especially given the short turnaround time. With the tins out of the shop Sean could build the bike back up, running new wiring, fitting up adjustable rearsets and levers, and using braided lines throughout. With it all buttoned together Sean wanted to dial it all in before handing the keys over to Ralph, “I was a bit nervous to set out on the maiden voyage. My smile barely fit in my helmet. I was so relieved and excited that it performed perfectly!” So where does the name come from? It’s Japanese for a young female Samurai warrior who’ll cut off a thousand heads and look incredible doing it, perfect!